Very pleased to announce two new special dates for you! First up is THE ESSEX CRAFT & DESIGN SHOW on July 28th/29th. I'm very proud to be part of this fantastic event, all set in the beautiful Royal Horticultural Society gardens at Hyde Hall in Rettendon, Essex. This is a two day event featuring the very best in art, photography, ceramics and crafts. 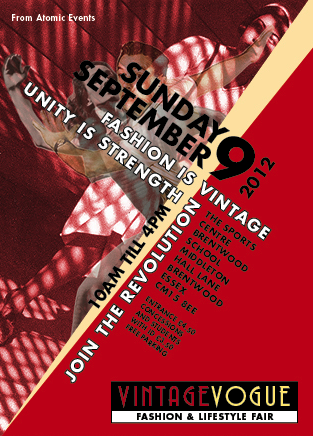 Next new date is the very special VINTAGE VOGUE – FASHION & LIFESTYLE FAIR on September 9th in Brentwood, Essex. This amazing fair is always a great day with its own unique atmosphere. Very pleased to be back there once again. So here is a little reminder of all my tour dates coming up, make a note in your diaries! !